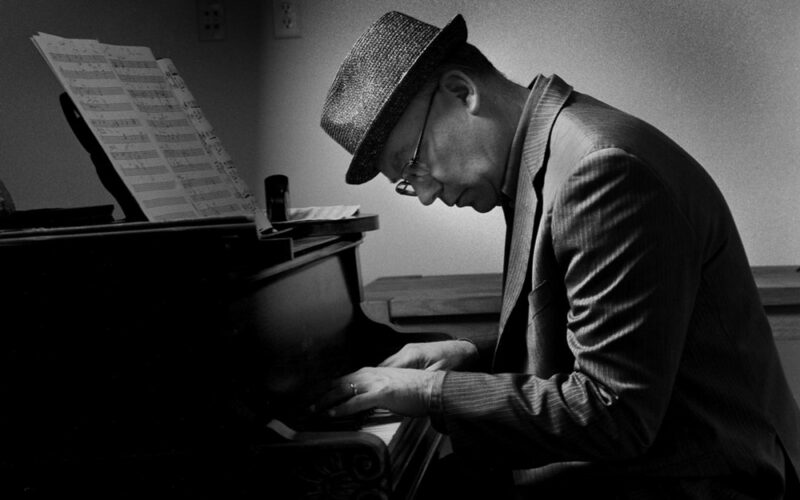 Earlier this year, Seattle’s prolific pianist/composer Wayne Horvitz was named a Doris Duke Performing Artist, alongside the likes of Dave Douglas, Wadada Leo Smith, Henry Threadgill, and others. The award, which grants artists $275,000 each, signifies a deeper investment in the potential of dedicated artists, empowering them through the freedom of unrestricted support while celebrating past achievement. Horvitz’s principal goals with this award included the completion of his projects 21 Pianos and Those Who Remain, Part II, as well as taking time to consider new projects for the coming decade. One of these projects includes curating and presenting a festival at The Royal Room highlighting great works of seminal avant-garde and experimental artists of the mid-20th century. Titled Ancient to Future, the festival features nearly 30 local improvisers in three nights of music paying tribute to artists including Ornette Coleman, Eric Dolphy, Billy Band, and more. Earshot Jazz recently caught up with Wayne Horvitz to discuss each of these projects. Horvitz spent much of the fall traveling throughout Minnesota for his interactive, site-specific 21 Pianos project. Bringing his extremely out of tune, small, 67-key “ship’s” piano into 21 towns, he invited people to play at locations including community centers, local radio stations, and cafés, and recorded their pieces. The results were splendid and varied, ranging from classics “The Girl From Ipanema” and “Ain’t She Sweet” to a fifth grader’s spiritual rendition of “Kumbaya,” while others were improvised or originals. The end result will be a two-CD release, packaged along with 30-40 pages of pictures and Horvitz’s writings about the experiences, something that could be “a small coffee table book,” he says. Until then, fans can read about his travels and see photos at the project blog, 21pianos.com. Learn more about 21 Pianos and more of Horvitz’s projects at 21pianos.com and waynehorvitz.com. Wayne Horvitz’s multidisciplinary installation Those Who Remain, Part II, premieres at the Seattle Asian Art Museum from Thursday, January 26, through Sunday, February 5. The installation is an electronic recording and video that run during regular museum hours; additionally, there will be four nights of dance and solo improvised music that will be performed with the installation. Those Who Remain, Part I, premiered in Seattle at the 2015 Earshot Jazz Festival as part of Seattle Symphony’s Sonic Evolution series. Inspired by two poems by the iconic Northwest poet Richard Hugo, Part I, “Concerto for Orchestra and Improviser,” was a two-movement composition for orchestra (Seattle Symphony) and improvising soloist (guitarist Bill Frisell). The second module of Those Who Remain is a multidisciplinary collaboration between Horvitz, Tokyo-based video artist/VJ Yohei Saito, and choreographer Yukio Suzuki. As with 21 Pianos, Horvitz will further explore his concept of electronic manipulation to compose a new score from the recordings of the Seattle Symphony performance. From there, he and Saito will collaborate on a sound and video installation that builds on Richard Hugo’s vision of small town life, the fate of industrialization, and the West. Suzuki will choreograph a series of dance solos that interact with the installation, which he will perform during Those Who Remain: After Hours, four nights of the installation featuring eight solo performances by Seattle improvisers alongside the dancer. “Essentially, it’s a duet with the installation,” explains Horvitz. On Friday, January 27, Horvitz is joined by saxophonist Skerik and clarinetist Beth Fleenor; Tuesday, January 31, trombonist Stuart Dempster and percussionist Greg Campbell perform; Friday, February 3, finds violinist Alex Guy and trumpeter Raymond Larsen; and finally saxophonist Ivan Arteaga and cellist Peggy Lee close the series on Saturday, February 4. After its Seattle premiere, the installation will move to various cities in Washington, Montana, and British Columbia. Those Who Remain, Part II, is supported by MAP Fund and the Japan Foundation through the Performing Arts JAPAN program. Tickets and more information at seattleartmuseum.org. The first weekend in January, The Royal Room presents a three-night festival of music, honoring the iconic artists of 1960s-70s experimental and avant-garde jazz. Wayne Horvitz, along with saxophonist Ivan Arteaga, have curated a lineup of nearly 30 of Seattle’s top experimental improvisers to celebrate greats including Ornette Coleman, Anthony Braxton, Cecil Taylor, ICP Orchestra, and the Art Ensemble of Chicago, from whose 1987 seminal album the festival takes its name. “This is some of my favorite music,” says Horvitz, “but more importantly, it’s some of the music that influenced me the most at a critical point in my life.” Listening to the Art Ensemble of Chicago, Anthony Braxton, and Sun Ra from age 17 to 24, he says, helped determined who he was musically. Arteaga, who was leaving for his honeymoon in three days, immediately agreed. The two wound up selecting albums Eric Dolphy’s Iron Man, Cecil Taylor’s Unit Structures, and the Art Ensemble of Chicago’s Fanfare for the Warriors, plus several others, to highlight among the nine sets of music over three nights. Though this series is important to Seattle’s community of musicians who regularly perform experimental and avant-garde music, Horvitz thinks it’s equally important for audiences to engage with these works. Tickets for Ancient to Future are $12 in advance, $15 at the door, and are available at StrangerTickets.com.